Per the Seller: Professionally maintained. Everything is in working condition. Mechanics condition checked annually with pre-check at the beginning of the season. Stored indoors during offseason. This boat has spent its entire life on the Great Lakes - No salt Water *Equipped with full-color screen Garmin GPS. 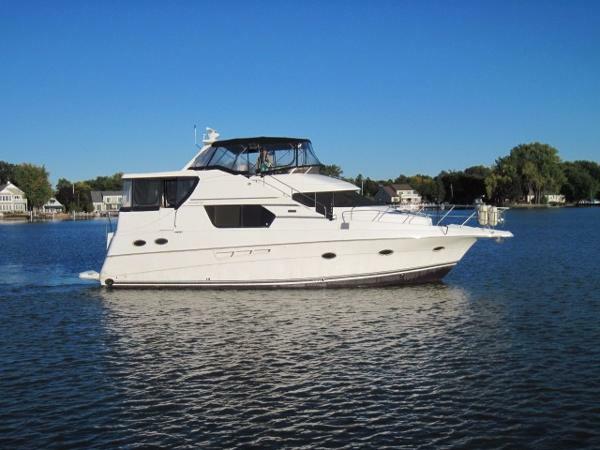 Stock #142368 FRESH WATER ONLY vessel - Spacious layout and many features for day cruises or extended cruises. 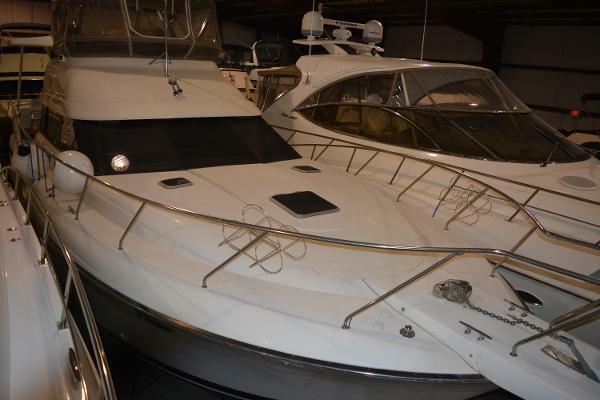 If you are in the market for a sportfish/convertible boat, look no further than this 1988 Silverton 34 Sedan Bridge Convertible, just reduced to $20,200 (offers encouraged). 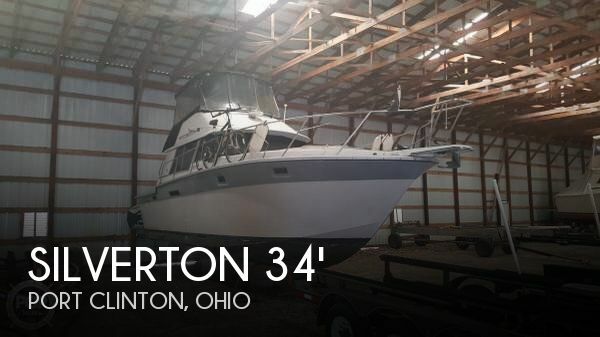 This vessel is located in Port Clinton, Ohio and is in great condition. She is also equipped with twin Crusader engines that have 1,100 hours. Reason for selling is lack of use. The vessel is in good condition. Second Engine rebuilt in June of 2017. New shift cables and new throttle cables. Upholstery and carpet could use cleaning. Wallpaper needs some repair. Seller states the foundation of the boat is sound. Very roomy with plenty of space to roam. Nice aft deck with swim platform. Stock #137148 Brand new head 8/2018! Great condition! Low hours! Spacious interior! Loaded and ready to cruise! 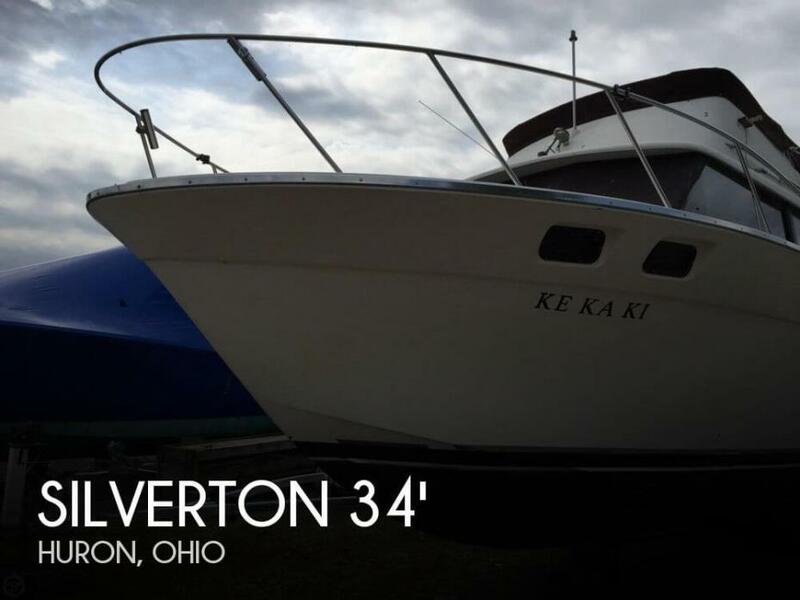 If you are in the market for a sportfish/convertible boat, look no further than this 1980 Silverton 34 Convertible, just reduced to $21,000 (offers encouraged). 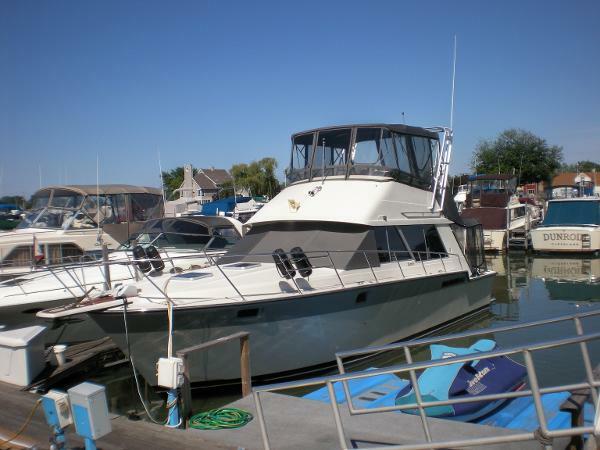 This vessel is located in Lorain, Ohio and is in good condition. She is also equipped with twin Chrysler engines that have 300 hours. Reason for selling is bought another house and doesn't have the bridge clearance to get there. has too many boats!. Boat is reported to be in good mechanical condition. She had one short block replaced and motors run well.. All upholstery on boat is worn and old looking. She has plenty of room for cruising or fishing, and cabin is laid out nicely. This can be a good opportunity for the right buyer. Please inquire! Stock #080233 The 34 Sedan- A capable, roomy, freshwater cruiser. 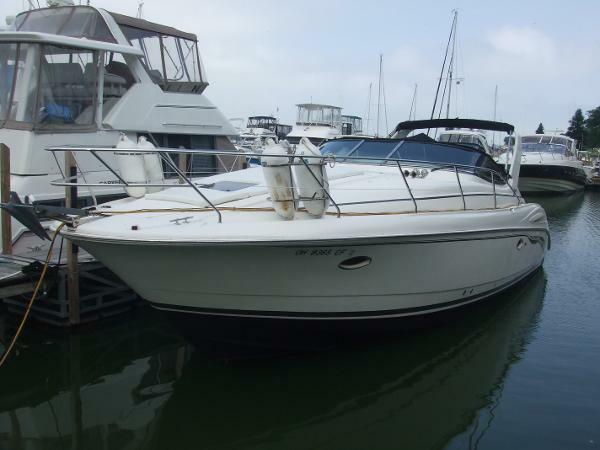 If you are in the market for a sportfish/convertible boat, look no further than this 1980 Silverton 34 Sedan Cruiser, just reduced to $11,500 (offers encouraged). This vessel is located in Huron, Ohio and is in decent condition. She is also equipped with twin Crusader engines that have 600 hours. 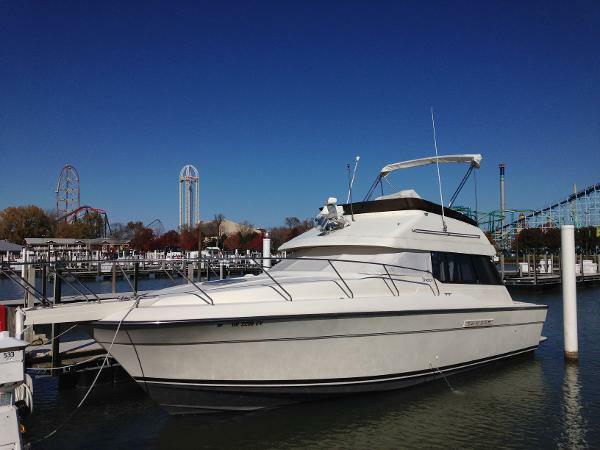 1991 Silverton 41 Aft Cabin Just In! Spacious, comfortable, and well taken care of, are three ways to describe this vessel. This boat has been used here in the great lakes with extremely low hours (under 500) . This boat will have everything you will need for a weekend trip. New in 2014.. New Canvas Bow Thruster New Upholstery New Stereo Flat Screen TV Impellers This boat is also equipped with.. Generator (under 200Hours) Two heads Aft Cabin with full size bed and privacy door GPS Call today for more details! 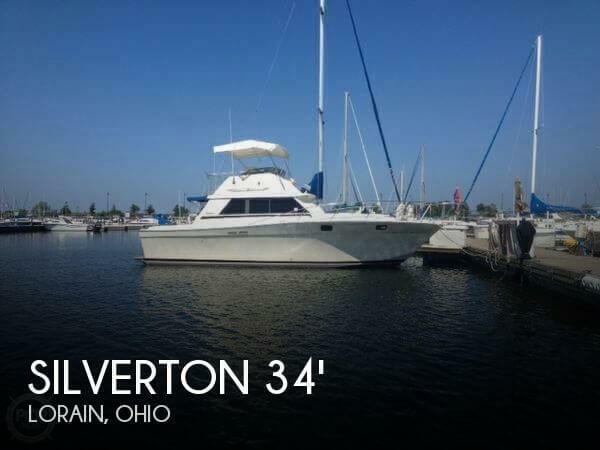 1999 Silverton 453 Pilothouse Motor Yacht Exceptional example of very livable Silverton Pilothouse Motor Yacht! This is a one owner boat that has lived a very easy life here on the fresh water Ohio River and has been kept under a covered slip since new! 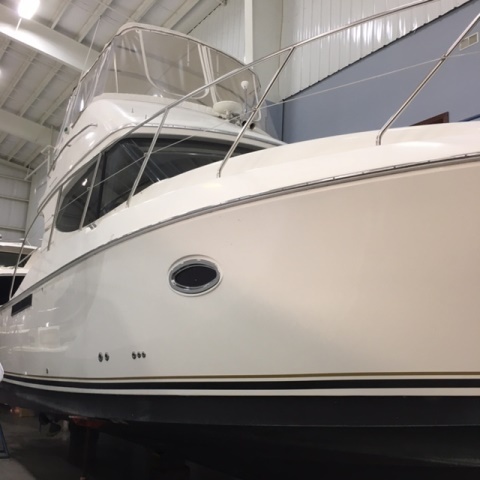 Owner has had a professional detailer maintain the boat since new and it is beautiful! Powered by a pair of Cummins 450C's with 830 hours of total time on the clocks. Boat is well equipped including the following:13.5KW Kohler Gen Set - 909 hoursEngine Synchronizer with Electronic ControlsFire Suppression SystemOil Change System For Engines and Gen SetSpare PropsACR Remote SpotlightLower HelmRaymarine C-80 Radar/Chart on BridgeRay 398 GPS Upper and Lower HelmRaydata Depth/Speed/Sumlog Upper and Lower HelmRay 210 VHF Upper and Lower HelmKVH Tracvision G4 Self Tracking SatBack Up CameraWindlass with Helm RemotesFull Enclosure for Aft Deck and Bridge (Aft Enclosure New)Marquip Davit on Aft Deck Hardtop2001 Caribe T12 Tender with 2001 Nissan 25 HPJVC AM/FM/CD on BridgeCustom Seating on Aft Deck w/Storage BelowAft Deck Wet Bar w/IcemakerNautical Outfitters Tide-Rite Folding Side Boarding StepsSalon TV with Component Audio/Video Reciever/CD/DVD and Bose Surround SoundFlexsteel Salon Sofa w/InclinersSub Zero Fridge and Sub Zero Freezer in GalleyForce 10 4-Burner Stove w/OvenMicrowaveCoffee MakerWasher/DryerTV/DVD in VIP StateroomTV/DVD in Master StateroomVacu-Flush Heads with Holding Tank and Macerator SystemMuch more.. Seller is getting out of boating and is leaving all loose gear on board. This is truly a turn key boat all the way down to the nautical glassware! Boat is located at a near by marina and can be shown easily. Please call ahead to schedule your showings. 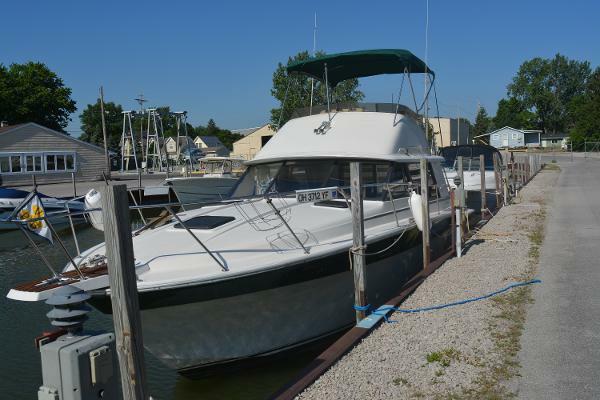 Seller wants boat sold! 2007 Silverton 33 CONVERTIBLE, Wonderful opportunity for an "all-freshwater" fishing & cruising machine. This boat was purchased through the SkipperBdus in Marblehead, Ohio and maintained here. She was actually purchased brand new by these owners at the 2008 Cleveland Boat Show! The owners keep her in tip-top shape will have no issues. The V-8 Crusaders really make her fly on the water. She has VHF, RayMarine C90 color plotter & top of the line fish finding transducer installed (although this boat wasn't really fished). The owners are moving onto another chapter and want to free up some cash. Call in or stop by the Marblehead, Ohio location for all the details. It is stored inside too! Trades considered. 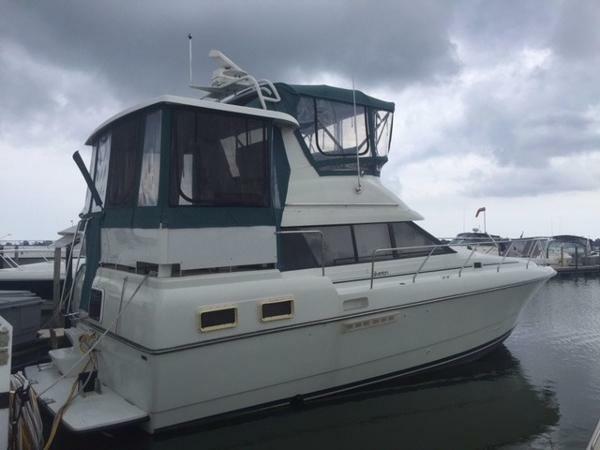 1999 Silverton 453 Motor Yacht FRESH WATER 1999 Silverton 453MY with Cummins 450C power (653 hours) loaded! This one has a bow thruster, stern thruster, Radar, GPS, Chart Plotter, Auto Pilot, 4 AC units, hard top, washer and dryer, etc. With her cavernous interior, the Silverton 43 Motor Yacht was aimed at buyers who valued condo-style interior accommodations more than graceful styling. The 43 is a big boat for her length, and her vast interior is made possible by Silvertons signature SideWalk deck plan. Instead of traditional side decks around the salon, the 43 features a set of walkways leading forward from the flybridge along both sides of the house. This is a design Silverton has been using successfully for several years, and it makes deck access easy and very civilized. Below, the expansive salon of the 43with its wraparound cabin windows, light cherry woodwork, and high ceilingsgives one the impression of being aboard a much bigger yacht. Both staterooms are fitted with queen berths, and both heads are split to separate the shower stalls from the toilets. A wet bar is standard on the aft deck where a curved stairway leads down to the swim platform. Topside, the helm is forward on the flybridge with guest seating aft. Built on a beamy modified-V hull, T-430hp Cummins diesels cruise the Silverton 43 at 1819 knots with a top speed in the low 20s. 1984 Silverton Convertible Price Reduced! 1984 34' Silverton Convertible Classic is a rare find. In the water looking good. Excellent Condition! In the Water ready for a Sea Trial! Lets Go! Equipped with Crusaders Captains Choice Twin 270 HP delivers 540 total horse power. 990 Hrs she runs like new, rebuilt Carbs. Fish Finder, ship to shore, Bimini, all in good shape. Misc Ignition upgraded to transistor, oversized trim tabs, new grounding plates, bottom redone, vibration free shaft with 4 blade prop. Oil changed in 2015, Fuel Filters new, 2 Newer batteries 27 group, half a tank of gas for you...its ready! 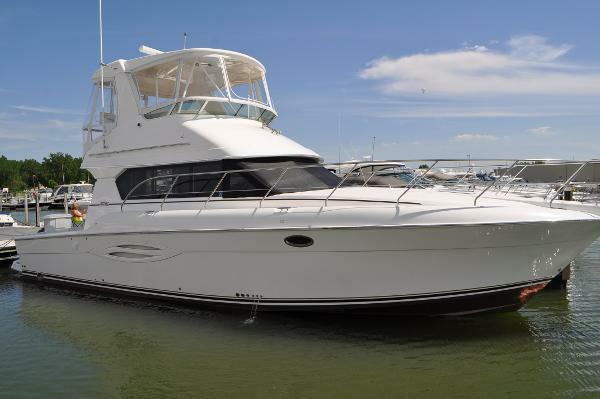 2004 Silverton 42 Convertible All Fresh Water - Well Maintained - Kohler Generator The Silverton 42 Convertible offers incredible accommodations with luxurious appointments. A wide hardtop-crowned flybridge provides plentiful seating and storage. The command helm provides good visibility and the controls are at the captain's fingertips. The unique molded steps are great for accessing the bridge - no more ladders to bump those knees. The split head and shower arrangement make cleaning up easy.This boat is off site, please call to set showing appointment.Sales office is closed on Sundays. 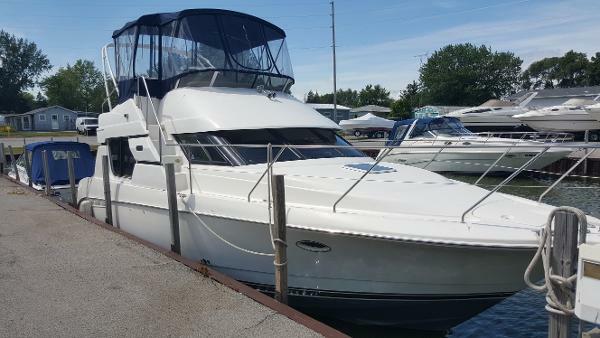 2000 Silverton 351 Sedan Cruiser IF your looking for something small enough to dock anywhere and large enough for a good ride, you can stop looking because this is the boat for you! 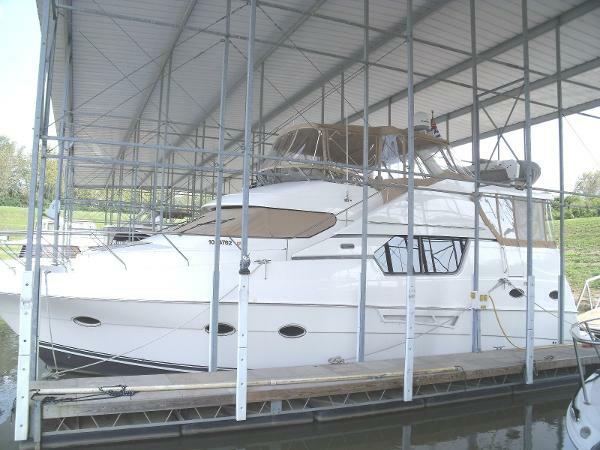 This beautiful 35' Silverton has many features the whole family can love. Starting with a large cockpit area great for lounging or fishing, to the spacious interior for living. She has everything you would want/need air conditioning, head with separate shower, stove with a full size refrigerator and many more. She has low hours just under 500 and was very well taken care of. Call now for more information. 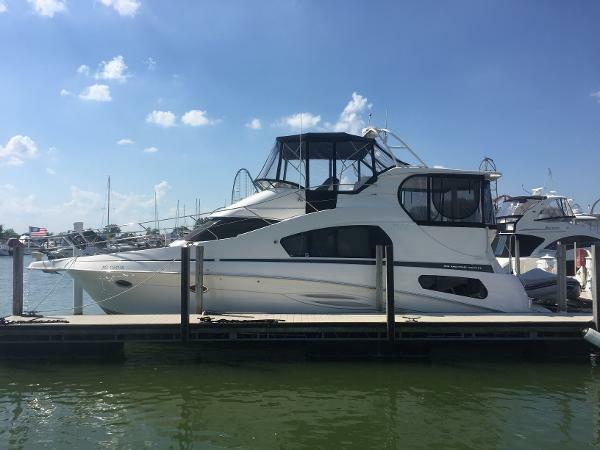 1990 Silverton 34 Convertible Reduced----Includes heated storage for 2015-----Reduced Family Getaways, Fishing Excursions, Barbecues, and sipping Champagne! This spacious motor yacht is just waiting to take you, your family, and your friends on your next luxurious adventure!Stepping aboard into the aft deck, a sturdy ladder leads to the spacious flying bridge with captain’s and mate’s chairs plus a large “L” shaped settee. From the cockpit, a sliding glass door opens into the main salon with convertible sofa to starboard and entertainment center to port. The galley is down three steps but open to the salon. There is a large dinette opposite the galley to port. The luxurious forward stateroom has centerline double berth, hanging locker, and private head with shower stall to. More pictures are coming soon!! !